“I couldn't wait to get to the most powerful position because I thought then I would be able to fix problems that only a leader can fix. But when I got there, I realized we needed a revolutionary change.” These are not the words of the just-inaugurated President Trump, even though they could easily be mistaken for his. These words belong to another president, long fallen into oblivion: the last Secretary General of the Communist Party of the Soviet Union and its first and last president – Michail Gorbachev. Unlike Trump, Gorbachev presided over a true “empire of evil”, driven by ideological fanaticism, economic determinism, and political oppression – in a way, a complete opposite of the U.S.: USSR was a communist dictatorship, U.S. is a capitalist liberal democracy; Gorbachev was a career apparatchik and a sincere believer in the virtues of communism, Trump is a businessmen with no prior political experience, whose belief in capitalism is perhaps the only certain characteristic of his. Yet, somehow certain structural parallels unmistakably appear between the two, and the historical lessons from Gorbachev’s failed attempt to shake the corroded political system he came to preside over may be instructive for the incoming Trump’s presidency. 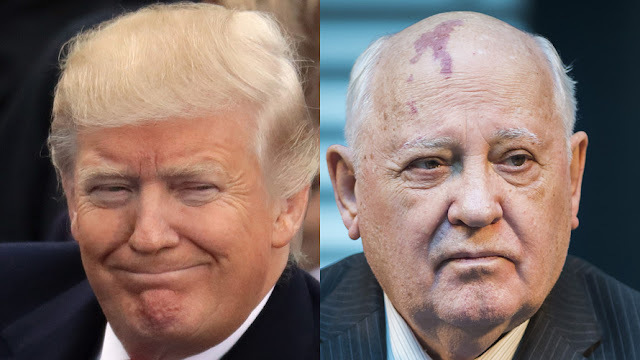 Like Trump, Gorbachev too wanted to reform a stunted political system and an obsolete military alliance; he too, wanted to “drain the swamp” of octogenarian career politicians, who had usurped power and monopolized the policy space, not allowing fresh blood to stream in; and he too believed the system to be rigid and hard enough to sustain the shock from his reforms. When Gorbachev came to power in the spring of 1985, he declared his intention to begin the perestroika – a radical by all means in the context of the tightly controlled Soviet society reform that was intended to jiggle out the deep state from its hardened and corroded condition of lethargy, to shake the establishment out of its affected ease and comfort, and with the explicit promise “to return the power back to the people.” At that time the economy was failing, GDP growth was less than 1.6% while the Soviet public debt was skyrocketing, the communist ideology was no longer hegemonic, and the propaganda was unable to keep up with the penetrating force of the American soft power thanks to technology and globalization. The Warsaw Pact, the military alliance established in the mid-1950s to counter NATO’s deterrence power, was largely dysfunctional, with its member-states forced to recycle old Soviet military equipment and pay the prime price for it. Most importantly, a growing number of disillusioned people all across the Communist bloc held deep resentment to the political status quo and readily embraced Gorbachev’s perestroika in hope to finally unsettle the system. Gorbachev’s agenda for perestroika focused on three elements: liberalizing the stagnant planned economy with free market private initiatives; allowing for workplace “democratization”; and loosening the grip on the Warsaw Pact, by transferring some of its financial and logistic burdens to the member states. Most importantly, Gorbachev opened the possibility of doubting key principles of the communist ideology, on which the entire system was built. From our historical fait accompli point of view, we know that ultimately Gorbachev’s perestroika failed. It set in motion a chain of events that could have only ended with the destruction of the Soviet empire. The complexity of the system simply did not allow it to just have some of its key elements reformed, without collapsing the entire edifice. From his own point of view of that time, however, all that Gorbachev wanted was to make the Soviet Union “great again.” What he did not recognize was that the system seemed hard from the outside, but was all mushed and soft from the inside. Trump faces similar risks today with regard to the post-Second World War liberal democratic order America has built. Like most Western economies, the American economy today too is affected by automatization, globalization, and the export of unskilled jobs to China, Vietnam, Indonesia, India, Mexico, and Brazil. The public debt is in its all-times high, while the trading deficit with “emerging economies” is growing. Trump wants to bring back protectionism and halt globalization. He questions NATO’s “shared values” raison d’être and loosens up the commitment to “peripheral” member-states, such as the Baltic and the Balkan countries. He advocates for the return to historically traditional military alliances which have appeared whenever they were needed and stopped to exist whenever the need for them was no longer there. And he wants to transfer the transaction cost on those who need the American protection the most. Perhaps, most troubling, while remaining committed to the “democratic” part of the American liberal democracy, at least in words, he openly questions the “liberal” part in it, with incessant attacks on civil and human rights. For what is worth, some of his skepticism is justified. China’s vital economic role for the U.S. and the global economy has so far tied the hands of the American policy-makers during the Bush and Obama administrations to rein in the Chinese brutal advances in South and East China Seas. The E.U.’s 500+ million common market that was made possible largely thanks to the decades of U.S. security umbrella over it, is ostensibly eating away from the American commercial and economic global prowess. And, the “liberal democratic order” the U.S. helped institute as a dominant world order after the Second World War, is fast losing its steam, and not because of Trump’s election, but for a variety of other reasons that have predated it. The last global war, for example, was too long ago for its painful memory to serve as a bond between competing petty national interests, or to remind the younger generations about the destructive side effects of nationalism and protectionism. Democracy is no longer a hegemonic paradigm among non-Western states, and a wave of de-democratization is creeping even in some Central and Eastern European states. Worst of all, no one today, not even the United States, is willing to sit in the leadership seat of the global liberal democratic order, to take responsibility and to foot its bill. It is, in the words of one commentator, a truly “G-Zero World”. Trump’s radical solution for many of these issues is to go “back to the future”: to return to protectionism in order to revitalize dying industries and bring jobs “back to America”; to change NATO’s modus vivendi and alter the Asia-Pacific strategic military alliances’ core modus operandi, returning to a 19th century balance of power system; to weaken EU’s integration trends in recognition of the obvious fact that not China or Russia, but rather the EU is the largest economic competitor to the U.S. today; and to put greater pressure on China. Trump’s perestroika will be as radical to the 70+ American liberal democratic order, as Gorbachev’s original one was to the then 70+ Leninist communist order. Gravely ill patients sometimes have to get worse, before getting better; the contaminated blood has to be bled out, and the wounds cleaned in order to heal. Some seriously infected festering wounds require even amputation of limbs in order to save the rest of the body. But as Gorbachev found out in a painful way, he was presiding over a house of cards, with an ostensibly perfunctory dedication of the Soviet allies to the communist world system. His perestroika unleashed a tidal wave of frustration that wanted to see a revolution, not a reform, and brought up a collapse. The Soviet empire did not collapse because of external pressure, but because the center let go the periphery. Trump is fast treading in the same steps today. He too is a champion of a growing multitude of disillusioned supporters, many being passive and hard to detect, who may rise as a tidal wave to sweep the remnants of the liberal democratic order. He, too, wants to let the periphery go. But, unlike 1989, when the alternative to communism – liberal democracy – was readily available, today there is no alternative to replace the liberal democratic order. Trump’s Gorbachev moment is upon him, and all of us, today but without the alternatives. 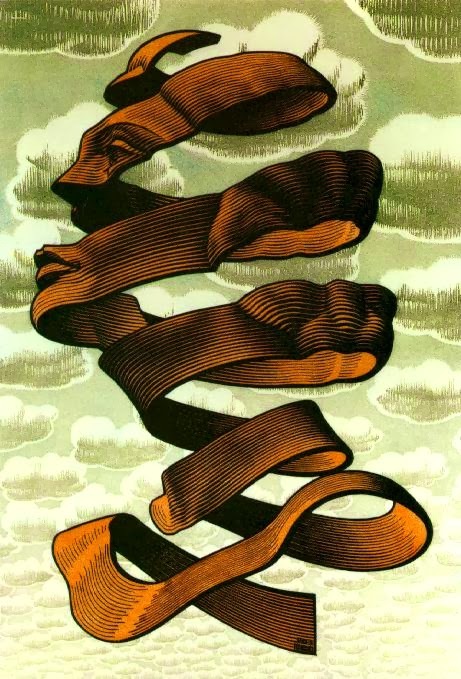 It is in such ideological and political vacuum spaces that monsters may be born.